1. Starting off with the new project of the week: 42-unit, 108-bedroom 802 Dryden Road. As relayed on the Voice, the parcel currently hosts several rental properties in varying condition. The project is Modern Living Rentals’ largest to date, partly because developer Charlie O’Connor tends to focus more on smaller infill in urban areas. Although no time table has been given for the $7.5 million project, a likely prospect is approval by the end of the year, with a spring 2018 groundbreaking, and a summer 2019 opening. While John Snyder Architects is in charge of design modifications, the townhouse designs are recycled from STREAM Collaborative’s 902 Dryden plan currently finishing up down the road. Marathon Engineering’s Adam Fishel will be shepherding the project through the approvals process, just as he did the Sleep Inn for Elmira Road. Location-wise, it’s on a bus route but most everything will need some kind of vehicular transport, so it’s fairly auto-centric. There isn’t a lot of lot nearby apart from a few small rentals and single-family homes, and Cornell farm fields. On the other hand, few neighbors means fewer people likely to raise a fuss at planning board and town board meetings. As long as they provide town favorites like heat pumps, don’t expect big hangups as this plan moves through municipal review. 2. So here’s something out of the blue. Recently, the house at 2124 Mecklenburg Road in Enfield was sold to “The Broadway Group LLC d/b/a TBG Alabama LLC”, and a $998,000 construction loan agreement was filed shortly afterwards. One does not normally see million-dollar projects in Enfield, but a look at the filing yielding no information other than to suggest it was a retail building. A little further digging indicates The Broadway Group, based out of Huntsville, Alabama, specializes in the development and construction of Dollar General stores. The lender, Southern States Bank, headquartered in Anniston, Alabama, is a preferred commercial lender for TBG. So this is a similar case to the Dollar General recently built in Lansing by Primax Properties – it’s less about a bank being interested in Ithaca, and more about two major companies located near each other and having an established business relationship. A check of Enfield’s Planning Board reveals that the applicant took great pains not to reveal the name of the tenant, saying only a stand-alone variety dry goods store. A confidentiality clause with client limits what they could say, and TBG will technically own the metal building for a year until it transfers over to Dollar General. Expect a Q4 2017 and with it, 10-12 retail jobs. I’ll be candid on this one – I sent out an email before writing anything up for the Voice asking if there were enough Enfield/West Hill readers who would care enough to justify an article being written. Jolene encouraged it, the piece went up, and the traffic on the article was actually pretty good, somewhat above average in fact. 3. The city has decided which option it wants to pursue for its rework of University Avenue. Basically, say goodbye to the northbound parking aisle and say hello to a new bike lane. The southbound parking aisle will remain, along with a 7-foot wide sidewalk and 10-foot travel lanes. 4. It looks like plans for the next Press Bay Alley are moving forward. 110-112 West Green Street was sold to Urban Core LLC (John Guttridge / David Kuckuk) for $650,000 on the 19th, and a $581,250 construction loan from Tompkins Trust was filed the same day. Technically, some of the construction loan is actually for the purchase; according to the IURA breakdown, the renovation into micro-retail, office and two 500 SF apartments will only cost about $207,500, plus $40,000 for soft costs like architectural plans, engineering and legal expenses. As part of the $200,000 loan extended to Urban Core LLC by the IURA, the project needs to create at least 6 full-time jobs at full occupancy. On the Press Bay Alley Facebook page, the developers have announced plans for a spring opening, and issued a call for active-use tenants looking for anywhere from 300-2,000 SF. 5. Cincinnati-based Bloomfield Schon has arranged to sell the Cayuga Green complex, lofts, apartments and all. The developer would sell the buildings to Laureate House Ithaca Management LLC. Upon the intended purchase date of August 1st, Laureate House would pay the IURA loan balance ($733,130 at the moment with a $4,880 monthly payment) off in full. That would be about 21 years earlier than anticipated. Laureate House appears to be a start-up real estate firm backed by three wealthy Cornell alums; although the literature says they seek to launch 55+ communities for active seniors in college towns, there don’t appear to be changes in use or commercial/residential tenant mix planned with the purchase of Cayuga Green. 6. Been meaning to note this, but it appears 210 Linden Avenue is undergoing asbestos remediation, which means that the building is being prepped for deconstruction. It looks like Visum Development will be moving forward soon with their plans for a 9-unit, 36-bedroom student apartment building on the property. I did not seen any outward indication of similar work being performed on 118 College or 126 College Avenue at last check, though it’s been a couple weeks. 7. Here’s a look at the city of Ithaca’s Planning Board agenda for next week. Harold Square and 323 Taughannock will have their latest revisions checked for satisfaction of final approval (various paperwork submissions, and of samples of exterior materials to make sure they’re acceptable). 238 Linden Avenue, 232-236 Dryden Road and the DeWitt House old library redevelopment are up for final approval, and the McDonald’s and Finger Lakes ReUse’s supportive housing projects will be reviewed for determination of environmental significance, which basically means that potential impacts have been addressed and if necessary, properly mitigated. There is also one semi-new project, which is 709-713 Court Street – that would be the street address for Lakeview’s $20 million mixed-use affordable housing plan on Ithaca’s West End. From previous paperwork, it is known that it’s 5 floors with 50 units of affordable housing, 25 of which will be set aside for Lakeview clients with psychiatric disability. There will be 6,171 SF of commercial space on the first floor, and 17 parking spaces. PLAN Architectural Studios of Rochester will be the architect. Apart from a rough outline, there have been no renders shared of the project, so that’s the “semi-new” part. Project Description: The Board approved project changes with conditions on May 23, 2017. The Applicant was asked submit revised materials to return to satisfy the conditions in June. Applicant: Trowbridge Wolf Michaels for DRY-LIN Inc.
Project Description: The Board approved the project with conditions on May 23, 2017. The Applicant was asked to submit revised materials to return to satisfy the conditions in June. Seems fair to move this one over into the construction column. Introducing 107 South Albany Street. The State Street Corridor represents one of Ithaca’s best possibilities for infill development. It’s a mixed-use area with a hodge-podge of buildings and styles, from ornate century-old properties to commercial utilitarian structures. It has a number of sites that have easy access to downtown and amenities, permitting a walkable lifestyle. It’s also less expensive than downtown properties. With this in mind, the city rezoned much of it in 2013 to allow for 5-story buildings, up to 60 feet tall, with no need for parking. The zoning was a simple box overlay regardless of lot lines, which resulted in some “secret” infill opportunities like 512-514 West Green Street, whose rear yard was in the rezoned area, and as a result, owner Carmen Ciaschi was able to legally slip in a two-family home without adding additional parking. 107 South Albany Street was rezoned as a result of the 2013 overlay. The existing property was a mixed-use two-story home that had an apartment on the upper floors, and converted on the first floor to commercial office functions (law office). This presented an opportunity for the enterprising developer. Enter Stavros (Nick) Stavropoulos. The West Hill native, whose family runs the State Street Diner, runs a small rental company, Renting Ithaca. However, Stavropoulos has slowly and steadily made his way from management to real estate development – first with additions to existing buildings like 318-320 Pleasant Street, and then entirely new properties like 514 Linn Street in 2015, and a project currently at 1001 North Aurora Street. His M.O. so far has been to find middling properties in desirable locations, and add inoffensive infill rental housing – nothing that stretches code, nothing that will anger the neighbors. Earlier projects were designed by Lucente family favorite Larry Fabbroni, but more recent projects have turned to a low-profile, longtime Ithaca architect named Daniel Hirtler, who runs Flatfield Designs. Stavropoulos picked up 107 South Albany Street for $236,000 in August 2015. Seemingly, each project he takes on is larger than the last. 1001 North Aurora is a 4-unit project, 12 bedrooms with a hard cost of about $400,000. 107 South Albany is slated to be his latest and greatest yet. 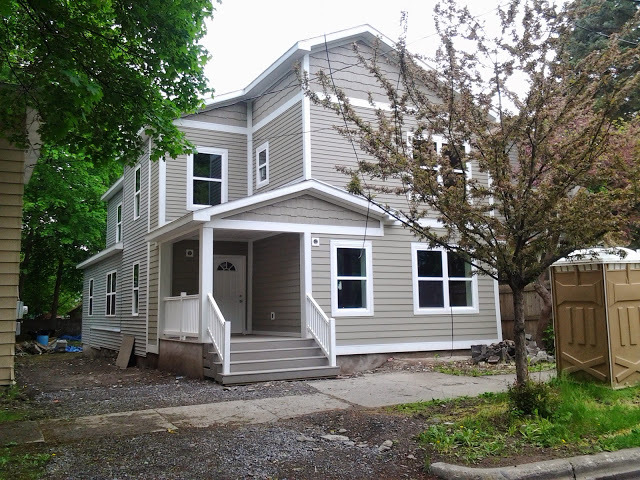 The original plan, as introduced in Spring 2016, was to build a new six-unit building at the rear of the existing house, and renovate the house into three apartment units, for one studio, six one-bedroom units, and two two-bedroom units. After a few months of planning board review and critique from the design committee, the 3,954 SF, $500,000 plan was approved and slated to start in July 2016. However, that plan never moved forward. Instead, this past winter, Stavropoulos decided to submit a new set plans. The new plan called for eleven units and eleven bedrooms, but instead of retaining the existing house, it would be deconstructed and replaced with a new three-story, 8,427 SF building. With its neighbors including a former gas station-turned medical service and older, historic structures, the building’s design is an attempt to bridge the gap. The front sports a cornice, a brick veneer on the first floor, tan fiber cement lap siding above and a traditional window arrangement. In contrast, a stucco finish fiber cement stair tower in the middle of the structure serves as a visual interest for passerby on West State Street, and gives the building a modern touch. The building’s height is capped at 40 feet 5 inches, well below the constraints set by the zoning. The building isn’t designed for active street use, with a recessed entry and bike storage area for privacy, and no first-floor windows on the front facade. However, in an attempt to create an attractive streetscape, the building uses lighted wall recesses on the exterior, the brick work will have decorative patterns, and a large semi-circular iron trellis that will be adorned with native twining vines. The project cost is $946,600, according to the city’s Site Plan Review document. As of this month, Finger Lakes ReUse has deconstructed the existing house, cleaned and processed the salvaged materials, and has them for sale at their warehouse/store on Old Elmira Road. The foundation and front staircase are all that remain. The plan is to start construction on the new building in the September/October time frame, and to have it open for occupancy by summer 2018. No contractor or construction manager has been named as of yet. This project isn’t 100% complete – some stone veneer still needs to be applied, and the landscaping needs to be seeded – but for practical purposes, the new wing is ready for occupancy and this project is done. The first hotel guests in the new wing are unpacking their bags this month, and already there are chairs out on the balconies. The project began in March 2016, which gives a period of about 15 months from launch to opening. Interior and balcony photos can be found on The Hotel Ithaca’s twitter account. As a project, it’s not inspiring architecture, and rather than market growth, it’s more about keeping the Hotel Ithaca successful in Ithaca’s upward trending downtown market. But it adds a few jobs, it’s a $15 million investment, and it demonstrates strong, sustained support for Ithaca’s leisure and hospitality market. Hart Hotels of Buffalo, founded by David Hart in 1985 and operating locally under the name Lenroc L.P., was the project developer. Krog Corporation, also of Buffalo and a favorite of Hart Hotels, was the general contractor. NH Architecture of Rochester, another frequent partner of Hart Hotels, was the project architect. NH Architecture is rather busy lately, as architect for both Dryden’s Poet’s Landing, and Lansing’s Cayuga View Senior Housing. Side note – I’ve heard through the rumor mill that the owners of the Sunoco next door have been offered very lucrative sums to sell their gas station, as it’s on a choice corner for development close to the Commons, and allows a 100-foot tall building. But alas, the owners have had no interest in selling. Over to the Tompkins Financial HQ. The rear face is a bit strange-looking at first glance because there’s a set of steel beams projecting right next to the first layers of gypsum sheathing, so it’s not clear where the back of the building is. A look at the plans indicates that the rear steel extension outlines a future stairwell, which projects a little further back from the main body of the building. The eastern segment of the skeleton has yet to be built past the elevator core, and consequently the rest of the rear/north wall projection has yet to be erected. As the rest of the structural steel is bolted into place, that will be boxed up, decked and sheathed. The lower floors have been sprayed with an undercoat of fireproofing, and are starting interior build-out with steel stud walls and concrete masonry units (cinder blocks). Under the safety cover, the fire-proof gypsum panels extend the full height of the building, with rough openings for future windows. Note that the top floor is set back a little bit from the lower floors, which can seen a little better in April’s update; this will be faced with a black brick veneer, while the projecting wall of the lower floors will be faced with a lighter stone. This feature was designed to make the building’s bulk a bit more subtle, and to respect the size and fenestration (window arrangement) of the DeWitt Mall next door. Still a ways out from its March 2018 delivery date, but it looks like LeChase has things on track. Admittedly, at the moment this pair of two-family homes looks rather bland from Aurora Street, and slapdash from Queen Street. However, it looks like the painting is just starting. The LP SmartSide wood siding will be painted with Sherwin-Williams “Rice Grain” on the first floor and dormer, and the second floor will use S-W “Sawdust”. The swatches of wood shingle on the eastern building have the darker color on both the second floor and dormer, which doesn’t match the city’s filing, but paint typically isn’t the type of detail that will get you in trouble unless it was a stipulation of approval. The short of it is, it’s not clear if anything has changed with the paint scheme, but it might have. The trim boards will be painted S-W “Nacre”. Another task still on the to-do list is building the porches that both units in the building will share. It’s a T-configuration – residents will step out and down their own step onto a shared landing at the top of the front steps. The porches will have decorative columns and banisters, and access panels below the porch landing. Most of the porch will be built with pressure-treated wood and painted in off-white “Nacre”, there will be dark brown steps (treated wood? ), and the access panels will match the siding. About the only thing not wood will be the handrails, which will be steel. A peek inside shows that the drywall has been hung. The next steps are typically flooring, cabinetry, bathroom fixtures and tiling, interior trim boards (baseboards, crown moulding) and painting. After that will come appliances and the finish work. The 3-bedroom, 1.5 bath units at 202 and 206 Queen Street should be ready for occupancy later this summer. There were going for $2325/month ($775/bedroom) on Craigslist, and there haven’t been any ads lately, so it’s probably safe to assume all four units have been rented. Stavros (Nick) Stavropoulos is the developer, and Daniel Hirtler is the architect. 210 Hancock is chugging towards completion later this summer. Lecesse Construction has all four sub-components of the apartment building have been framed and sheathed. Building A is almost finished from the outside, with some exterior finished and trim still on the to-do list. The Blueskin will be faced with Alpolic aluminum panels, some of which have already been installed. Masonry work is underway on Building C, using Redland Whitehall Brick (it’s not often one sees unpainted white brick). More information on the exterior materials can be found in April’s post. Note that the buildings are all elevated at least a few feet from ground level, and it’s particular noticeable with the five rental townhouses on the northeast corner. This is because of floodplain restrictions – several blocks of Fall Creek and Northside have the unfortunate luck of being in the 100-year floodplain, and most of Northside except for few blocks around Lewis and Jay Streets are in the 500-year floodplain. This approximated frequency is at risk of decreasing as the inlet gets clogged and layered with fresh silt, and with less volume and capacity, the un-dredged inlet would be more likely to have a high water event overflow its banks. It’s one of many reasons why the city is pressing for state dredging of the inlet before disaster strikes. WHCU reported a few weeks ago that INHS has had no shortage of applicants for the 210 Hancock rentals. After receiving over 200 applications, they set up a lottery in which 122 “made it through” , and then selected the top 60 (there are 59 rental units though…might be a just in case there’s a drop-out, or it could just be conversational rounding). If it’s anything like New York City’s lottery, what happens is that each application is validated, sorted for requested unit type, and is assigned a randomized log number – those who get 1-48 for the one-bedroom subset, and 1-11 for the two-bedrooms subset, are awarded dibs on a unit, so long as they pass the income check and background check. In previous measures, about 86% of rental applicants, six out of every seven, came from inside Tompkins County, with just under half from other parts of the city of Ithaca. The seven for-sale units are also just beginning sales marketing. The three on Hancock are, from east to west, 204, 206 and 208 Hancock Street, and the four for-sale units on Lake Street going south to north are 406, 408, 410 and 412 Lake Street. 206 Hancock, 408 Lake and 410 Lake will be 910 SF 2 bedroom, 1.5 bath units that will sell for $112,000 to qualified buyers. 406 Lake and 412 are 1088 SF, 2 bed 1.5 bath units priced at $129,000. The largest units, 204 Hancock and 208 Hancock, are 1300 SF, 3 bed 1.5 bath units that will sell for $145,000. The plan is to have buyers lined up for all seven units by the end of the year. Figure Cayuga View can probably go under the “under/construction” column. Finally. Cayuga View Senior Living, street address 16 Cinema Drive, is one of several Ithaca-area projects attempting to make a dent in the county’s lack of senior housing. Along with affordable housing and special needs housing, senior housing is often cited as something that the county needs a lot of more of, and soon. The county’s just-released housing strategy cites the need for 100-200 subsidized units by 2025, as well as a new skilled care facility. Various forms of senior care are expected to drive demand for an additional 750 units. A fully independent market-rate senior project like this isn’t explicitly categorized, but would potentially address some of the demand for senior housing in Tompkins County. Cayuga View is a mixed-use 60-unit project on the last vacant high density-zoned parcel in the village of Lansing. Like many projects, the Thaler Family and their business partners have taken years to get to this point. The Thalers have owned the land since 1971, and have divided it up over the years, for example subdividing the property in 2000 to accommodate the construction of the CFCU branch next door. The first record of Cayuga View is really for an entirely different plan by the Thalers – in fall 2012, they proposed “C.U. Suites”, a 3-story, 43,000 SF building with 39 apartments geared towards Cornell graduate students. Along with those units were 26 covered parking spaces and two commercial spaces. However, after getting approval for C.U. Suites, they decided to re-tool the project. At about this time, Taylor The Builders, a construction firm based out of Rochester, came on board as the general contractor, and it was determined that the student market angle “didn’t work very well”. In 2014, the revised plan, for “Cayuga View Senior Living” was rolled out. This was larger, 4 stories and 87,515 SF, with 59-62 apartment units depending on the iteration – Manley Thaler stated it wouldn’t be affordable or take federal funds, but he hoped to fill a niche below Kendal in the senior market. It took some time to go through Lansing village boards, planning and zoning. Cayuga View required a number of zoning variances and reviews of its legalese to clarify the rules for a 55+ community in Lansing – namely, the boards didn’t want the project to revert to general housing, and there was debate over a 10 year stipulation vs. a 20 year or 30 year stipulation (I’ve honestly never heard of senior housing switching to general housing). One BZA person was upset by the height of the building and wanted it to be one floor less, and a planning board member was upset by the lack of parking, about 100 spaces. After approvals for a tweaked 87,359 SF building were granted in Spring 2016, the project entered a sort of stall mode while it tried to obtain financing. Cayuga View Senior Living managed to land a construction loan earlier this year. According to a construction loan filed on May 25th, Five Star Bank of Warsaw (Wyoming County) is loaning the Thaler family and their associates $10.88 million to make their project become reality. Along with the loan, the Thalers and their business partners will be putting up $1,796,450 in equity to move the project forward, bring total costs to $12,676,450. It comes out to about $145/SF, a little less (~10%) than a comparable project in Ithaca city. Included with the project are 12 1-bedroom, 1-bath units (725 SF), 48 2-bedroom, 2-bath units (three floor plans, 900-1,110 SF), and 2,680 SF of retail space, with preference towards coffee shops, small eateries or services like a salon or barber shop. The webpage comes with rendered 3-D tours; I dunno about you folks, but if there are two glasses of wine sitting on the kitchen counter at 10 AM, my concerns aren’t going to be about unit availability. 5% of the units will be built handicap-accessbile, but all will be handicap-adaptable. The units will be priced upmarket, $1,550/month for a 1-bedroom, $2,250-$2,775/month for a two-bedroom, plus $200/month for top floor lake view units. With that comes a community center, in-unit washer/dryer, trash removal, fitness room, wi-fi, library/computer room, intercoms, rooftop garden, basic cable TV and pets under 30 lbs. for an additional monthly fee. Hot water shouldn’t be listed as a feature, but what do I know. According to their Facebook page, Cayuga View S.L. will be ready for occupancy by Spring 2018. NH Architecture‘s Roger Langer is the project architect. Note in the foundation excavation photos that the building will be built into the slope of the hill – four floors in the front (east), five in the back (west). There has yet to be an updated site plan posted, but parking will mostly be on the side facing the bank. At the end here is a shot of the Triphammer Apartments/former Chateau Claire renovation across the street. That is a separate $1.14 million project by Park Grove Realty to renovate 64 ca. 1960 apartment units (kitchen and bathroom remodeling, washer-and-dryer installations, roof repair, new balconies, gutters, landscaping and lighting), add parking stalls and a 425 SF rental office.